The more time astronauts spend in space, the more likely it will be that an astronaut will need to undergo surgery in zero gee. Which could get messy. The surgery itself will be another challenge. To combat microgravity aboard the ship, patients will have to be physically restrained, the authors wrote. Once the patient is secured, wrangling the bodily fluids that are leaking from that patient's open wounds will be another, messier challenge. "Because of the surface tension of blood, it tends to pool and form domes that can fragment on disruption by instruments," the authors wrote. "These fragments may float off the surface and disperse throughout the cabin, potentially creating a biohazard." Worse still: Without gravity holding the patients' bowels in place, they may float up and rest against the patients' abdominal walls while the patients are restrained, the authors wrote. This increases the risk that the patients' bowels would be accidentally "eviscerated" during surgery — leaking gastrointestinal bacteria into the patient's body and the ship at large. 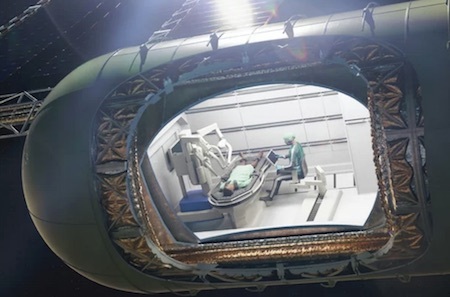 One proposal for avoiding contamination by blood and … whatever else … to cover the patient in a "hermetically sealed enclosure" separate from the rest of the ship. This could take the form of a specialty "traumapod," the researchers wrote, which would be a small, sealed medical module built into future spacecraft. I wrote about another alternative to open capsule surgery - see Surgery in Space. You might also like Space Rescue Technology in Fact and Fiction. I like the trauma pod idea - see Trauma Pod Battlefield Medical Treatment System.